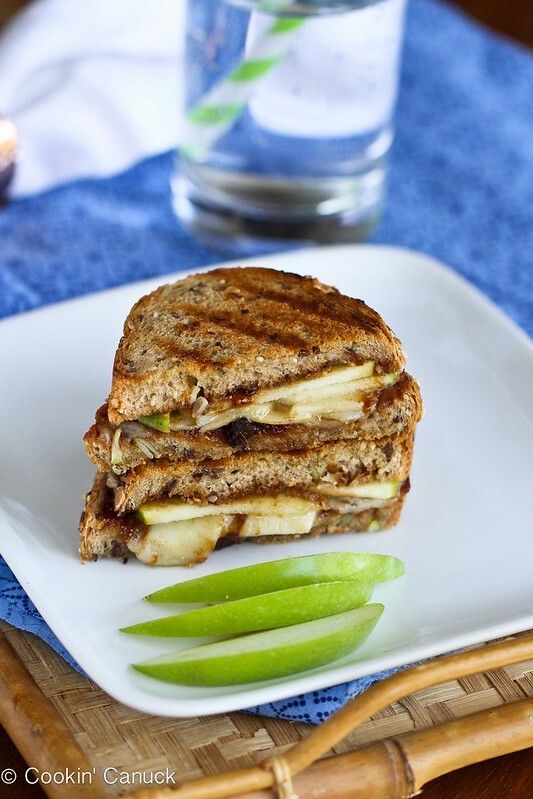 This Gruyère, Apples & Fig Panini Recipe from The Ultimate Panini Press Cookbook is an amazing combination of sweet and savory flavors.
. You see, yesterday was my dad’s 70th birthday and, in our family, he is known as The Sandwich King. In other words, this is his kind of book. One of the hardest things about living so far away from family is that we usually don’t get to give each other “live and in-person” birthday hugs. That just means that we have to catch up ten-fold when we see each other. But even though I’m not there, my dad knows that he means the world to me. He is truly every little girl’s dream of the perfect father…kind, caring, protective (but not overly), funny and supportive. He has always been there to listen and encourage. In fact, he’s always one of the first ones to read my blog posts, emailing me with grammar and spelling corrections – my own personal editor! Happy Birthday, Dad! I’m saving up plenty of hugs for you. 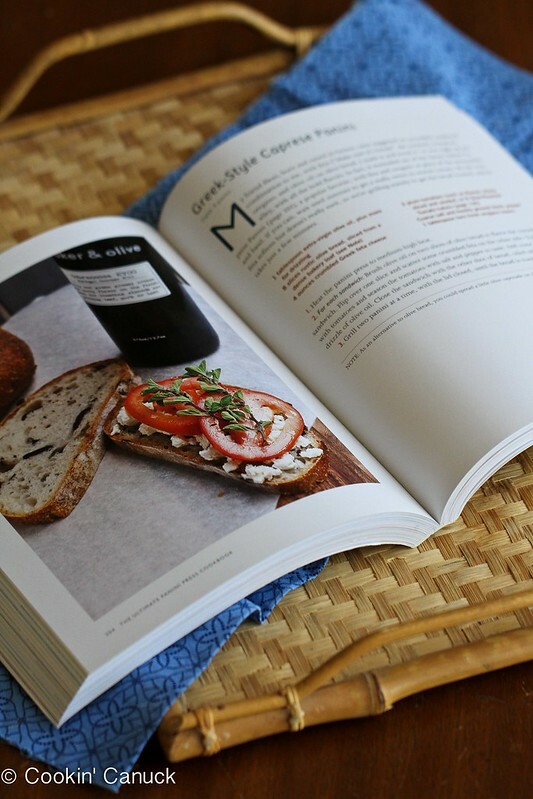 Let’s move onto this cookbook (scroll down to the bottom for a chance to win a copy). It is one that you are going to want to add to your library, or stock up on a few copies to give to friends and relatives during the holidays. 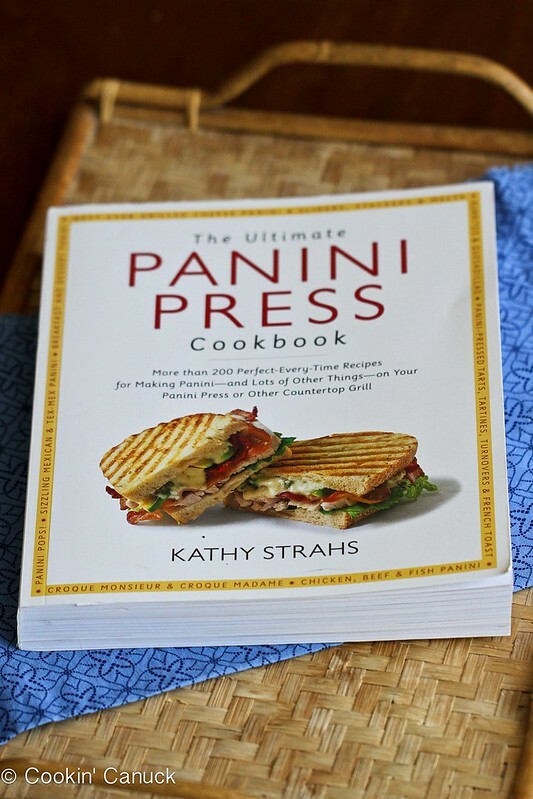 On her blog, Panini Happy, Kathy not only explores panini in every form (think sweet and savory), but she also shows us ingenious ways to use a panini press, such as grilling smashed potatoes. Her book, filled with fantastic photos that Kathy took herself, follows along the same lines. 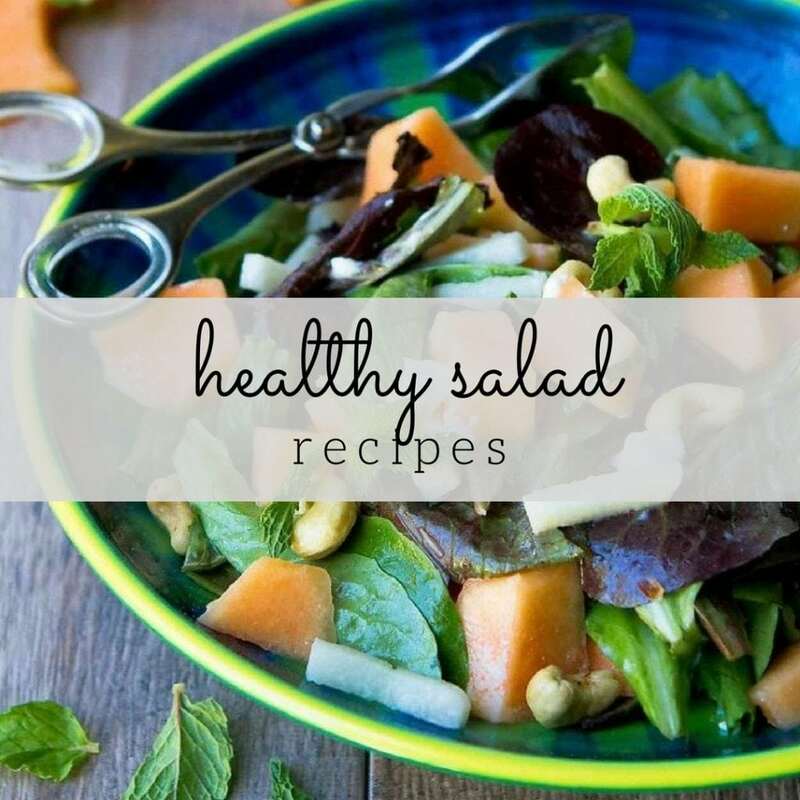 It’s packed with innovative recipes, playful personal stories and so much gooey goodness that you’ll be salivating just flipping through the pages. This recipe combines the sweetness of fig preserves, the tartness of Granny Smith apples and the saltiness of Gruyere cheese in one gooey, fantastic package. 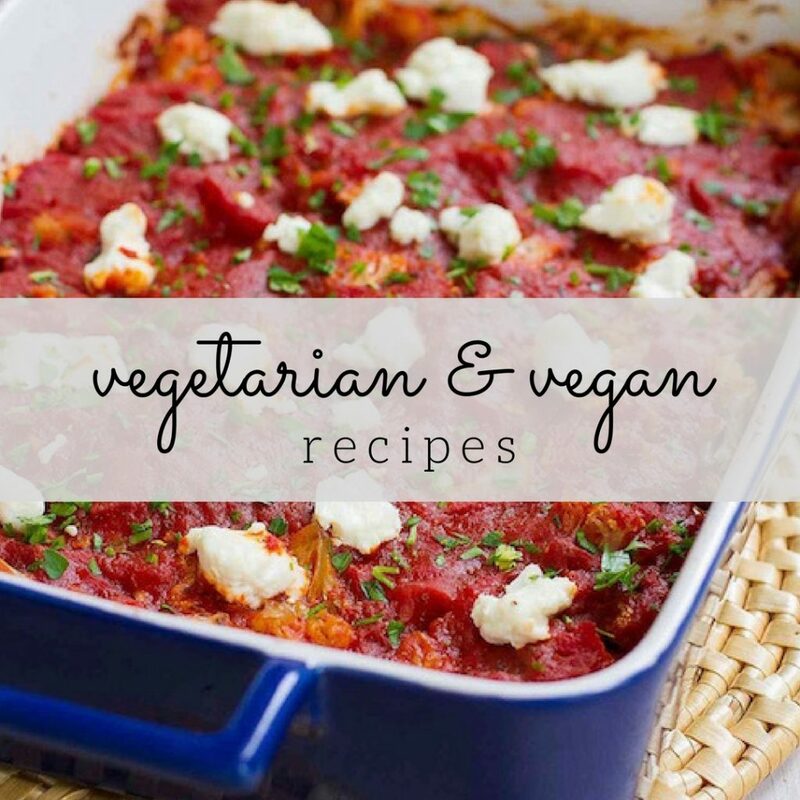 I made a couple of changes (reduced the amount of cheese and left off the butter) to reduce the calorie and fat content, but the idea is all Kathy’s, and the flavors are fantastic! For the serving size, I noted one half sandwich. This is a very hearty sandwich, and a half sandwich would be perfect when accompanied by a kale salad or bowl of vegetable soup. 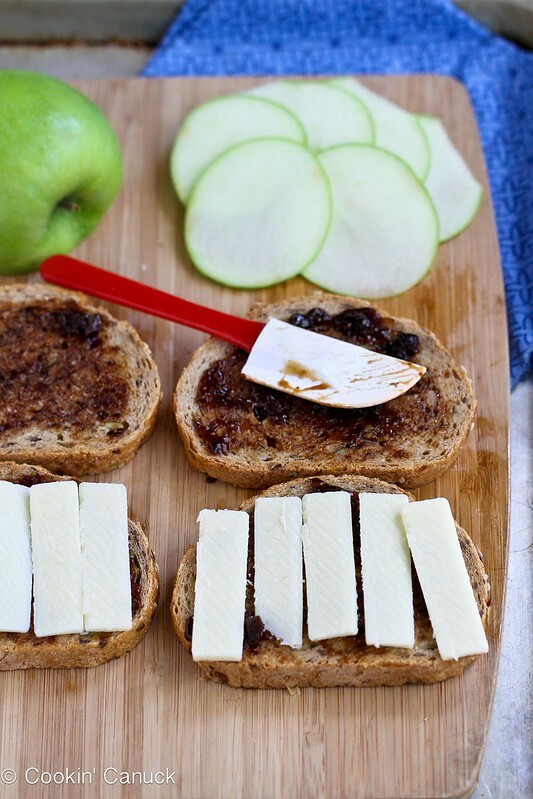 For each sandwich: Spread a layer of fig preserves on one side of each piece of bread. To one slice add cheese and apple slices. Close the sandwich with the other slice of bread. Disclaimer: A copy of this cookbook was provided to me for my personal use by The Harvard Common Press. They are also providing a copy for the giveaway. This post contains links to my Amazon affiliate page. Any revenue made from sales through these links helps to support this blog. Thank you! I love any kind of panini with cheese and tomatoes! This sounds amazing! It’s stunning! What a fantastic sandwich! Thanks so much, Dara!! And I love how you were able to easily adjust the quantities to suit your preferences – that’s the beauty of sandwiches, right? 🙂 Happy Birthday to your dad!! I don’t know. I don’t think I’ve ever had one. Wld love to win so I cks try them. Until I saw this Panini, it was a Panini with mozzarella basil tomato and balsamic vinaigrette but this one looks amazing !!!! Fave kind of panini: the caprese. . but this one looks fabulous! Totally going to try it!!! looks so delicious! That panini you just posted could quickly become my favorite! sounds yummy! And Happy Birthday to your Dad! My favorite panini is a roasted vegetable panini with gouda! I love any type of grilled cheese with additions of apples, bacon, or tomatoes. I bet those apples taste amazing in that! Happy Birthday to your Dad too! YUM. I’m all about the sweet and savory combo, but I also love a sun-dried tomato + bacon + turkey + cheddar panini. But if I tried this one I think I may have a new favorite…. I love bacon, sharp cheddar and fresh tomato slices! I need to get my mitts on her book! And I’m totally craving this sandwich now! This looks so delicious. Say you don’t have a panini press. What would you suggest? 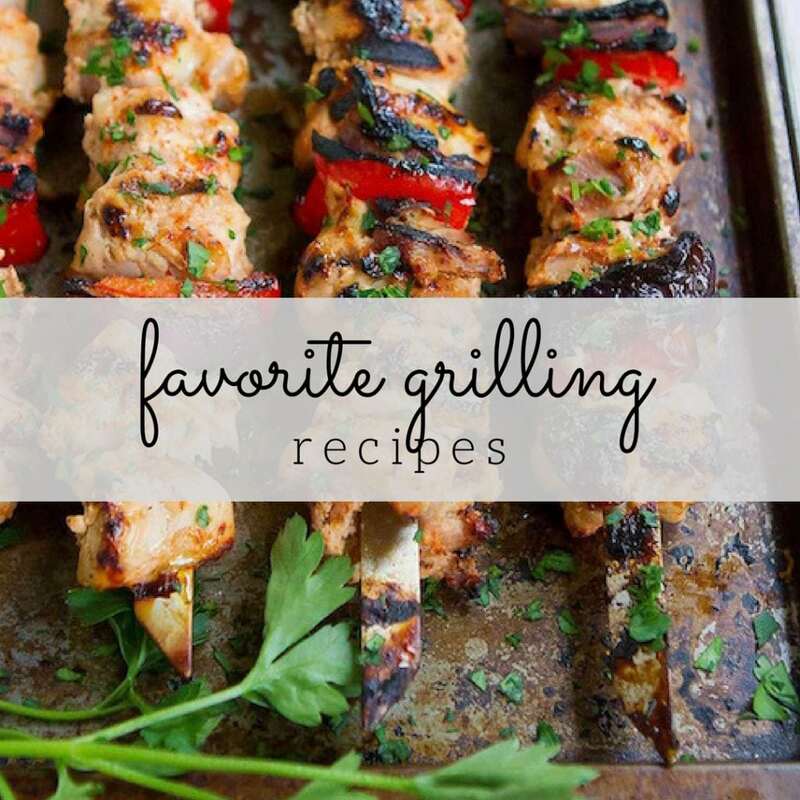 Vicki, I actually use a George Forman grill. However, before I bought that grill, I used a skillet and a brick wrapped in foil. Nope, I’m not kidding. The brick mimics the weight of the panini press. You’ll just have to flip the sandwich halfway through cooking. My favorite panini involves leftover turkey, swiss cheese, and thinly sliced apples. I like ham and cheese on sourdough bread. Hmmm. 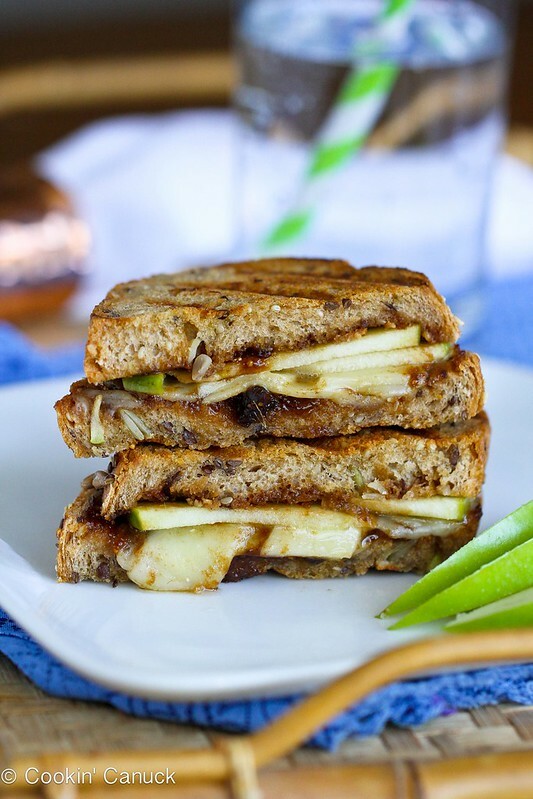 If I only had a panni press but that apple sandwich looks delicious that I am going to make it in my frying pan. My favorite kind of panini so far has been a turkey, bacon, and cheese panini. This one looks good too! Ham, cheese, and honey mustard – thanks! My favorite is Panera’s Smokehouse turkey panini. I would love this book for ideas to make panini’s at home! 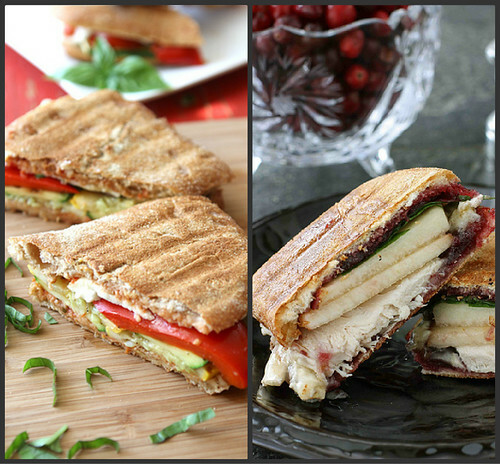 I don’t know of a favorite Panini…yet! We just purchased a Panini griddle/ press and cant wait to use it! Thanks! I love this panino and the book! I love honey ham, brie, and strawberry jam paninis! Linguica, egg and cheese with caramelized onions for a starter. Then we could go on from there. I love all kinds of paninis, but I do believe my very favorite go-to panini is gruyere, ham and a couple of red onion rings with some zippy mustard. Can’t beat it! Love Kathy and her panini creations are so so divine! I once had a panini with fresh mozzarella, raspberry jam, fresh rosemary & brown sugar on sourdough and it was the best one I’ve had to this day so I guess that’s my favorite! Mmm such an awesome sandwich! Love panini!!! Never get to post them cause we eat them too fast LOL. Great flavours!!! I Love a Panini with portabella mushrooms spinach, tomato and cheese! The only kind I’ve ever had was a Rubin. I love anything with cheese- the more cheese the happier I am. Chicken with Swiss cheese and garlic sauce. Mmm. I’ve been eating a variation on the panini you shared today for the last week and just loving anything with figs. Yours looks wonderful! can’t go wrong with a classic caprese! I love a good BLT panini. Yummy! This panini looks delicious. I love any panini with ham and cheese. I have to go for the good old fashioned tuna melt! Any kind of meat and cheese panini is what I opt for first when making them! Blackened chicken and brie with honey. So good. Grilled extra sharp cheddar and gruyere on pumpernickel. Cheddar, apple, and cinnamon on whole wheat. sounds like a yummy sandwich! I love a Roasted Rosemary Chicken Panini! Love a Panini with marinated eggplant and goat cheese! I am totally loving this flavor combination! 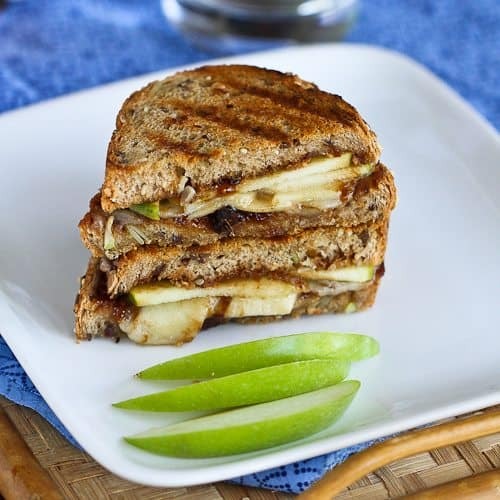 The Gruyère, Apples & Fig Panini looks marvelous. That will be my lunch today. My favorite fall panini had fresh roasted turkey, cranberry sauce and cheese. YUM! I am a big fan of creating my own panini at home. This is because I actually enjoy the process of putting my sandwiches together and cooking them. Best of all, there are lots of places to get inspiration from including cafes, sandwich shops, recipe books and websites. So thinking of what to make is not really a problem at all. Sometimes I simply buy a sandwich from a nearby store and then toast it when I get home. Then if it is one that I really enjoy, I add it to my list of favorites that I make myself.